At their worst, New Year’s Resolutions can be a quick way to enumerate all the things we think are wrong with our lives. If are feeling fat, we make a resolution to lose weight, if we are feeling stagnate, then we make a resolution to try more new things. Although New Year’s resolutions are not likely to be a fix all for everything wrong with our lives, they can provide an important opportunity to begin to do the work and make the change we want to see in our own lives. Here are some important steps when making resolutions to avoid losing the sprint, marathon, or both when it comes to winning the race of New Year’s Resolutions. Choose one to focus on at a time. 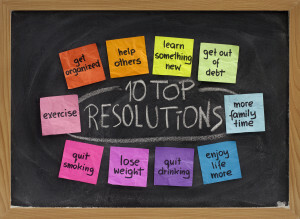 Resolutions normally come in multiples and as quickly as we make then they can go away. Making one important change in your life is hard enough, but making 4 at one time can quickly become discouraging as you may not see an immediate difference in any of them. The more you are discouraged the less likely you are to keep it up. Even if you have several you want to tackle throughout the year, they don’t all have to start on January 1st. Prioritize you resolutions and start immediately working on the one that is most important to you. With all your energy focused on one resolution you are a lot more likely to see some results and once you conquer one hurdle you will feel more encouraged to take on the challenge of another. Write down your resolutions and post them someplace you will see them. The saying “Out of sight, out of mind” still rings true. Having a constant, daily reminder of the commitments you made with your resolutions will help remind you to stay on path. Make sure it is someplace that is more permanent than just writing it on a sheet of paper. I am framing my resolutions and putting it on my night stand so I have to face them every morning. Share your resolutions in a group of loved ones. Plain and simply add some accountability. When we do something privately it is easy to just as quickly decide it is something that does not sound as fun anymore. Sharing your resolutions in a group will add some support and hopefully encouragement to you reaching your resolution goals. Set up times to check your progress. Accountability is closely tied to time. Having to associate a time frame makes the resolution less figurative “I want to lose weight” and more definitive “I want to lose 20 pounds by working out three times a week”. Once you have a definite resolution you can check your progress monthly or quarterly to make sure you are on track with your goal. Reward yourself for a job well done. Who doesn’t like a reward at the end of the day???? Well I know I do. Making sure you tie a treat to successfully achieving your resolution helps you celebrate your accomplishment. Subconsciously it adds an extra reward to the work and sacrifice it took to meet your resolution and encourages your brain to continue to try again with new resolutions.